Almshouses are unfurnished dwellings, usually specially designed with the needs of elderly people in mind. There are currently 28 dwellings with both single and double accommodation on the ground and first floor. Each flat is self contained with a lounge, kitchen, bedroom and bathroom. All flats have central heating and there is a shared laundry room. The aim is to provide convenient and comfortable accommodation in a setting which allows residents to come and go as they please. Almshouses provide security and residents are encouraged to make friends and to share a wider social life through use of the communal lounge and other facilities where they are available. An important factor in our Almshouses is the presence of a Scheme Manager and an emergency call system to every home. In an emergency, such as a sudden illness or after a fall, a resident can quickly get help. In addition, there are many other facilities designed to make daily life as easy as possible and to foster a sense of community, and to encourage neighbors to show consideration and support for each other. The Scheme Manager is currently Mrs Ann Haywood, Nicholas Chamberlaine's Almshouses, All Saints Square, Bedworth, Warwickshire, CV12 8NR. Coffee Mornings are held in the Residents Lounge on the first Tuesday of every month from 10 a.m. when bacon sandwiches and other delights are served. The general public are warmly invited. If you, or someone you know, is interested in living in one of the flats you may want to refer to our Becoming a Resident for details on how to apply. 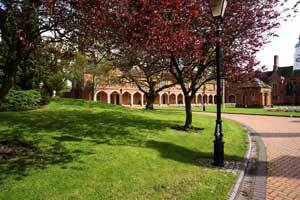 As the visitor walks from All Saints Square into the grounds of the Almshouses the eye is caught by an attractive square building standing in the centre of the quadrangle. Built at the same time as the Almshouses in 1840 the pump house was an essential part of daily life for the residents being the source of water for their daily needs. Enclosed in the stone and brick building are two hand pumps, which unfortunately no longer work, and were used by the residents to draw water from the ground. Bedworth was fortunate in being above a sloping seam of sandstone known as the Halesowen sandstone which in places was 100 ft thick and lying on top of a seam of coal. Being porous this sandstone absorbed and held water like a giant sponge and also acted as a very efficient filter and was also capable of transmitting it from one place to another. 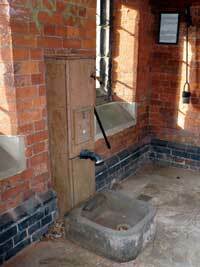 The bore hole for one of these pumps went into the sandstone ensuring a constant and clean supply of water. Whilst we can justly claim that the pict uresque Almshouses are the jewel in Bedworth’s crown, we can also say that the Governors Hall is the hidden pearl in its centre. 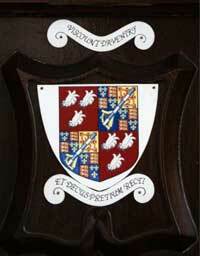 Since the beautiful oak panelled room was built in 1840 it has been the hub around which Almshouse life has revolved. 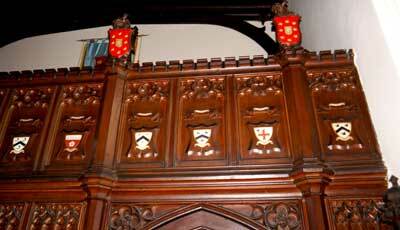 The present day governors still sit around the oak table, the wall panels are adorned by the coats of arms representing the chairmen of the trust since its formation in 1715. Overlooking one end of the hall is a magnificent gallery, often used by musicians to provide entertainment during less formal occasions. 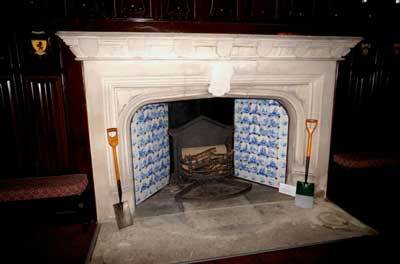 The other end of the hall is dominated by a large stone fireplace decorated by exquisite blue Delph tiles. Pride of place in the fireplace are two spades used by the Prince of Wales in 1934 and the Duke of Gloucester in 1988 to plant trees both of which still stand in front of the Almshouses. 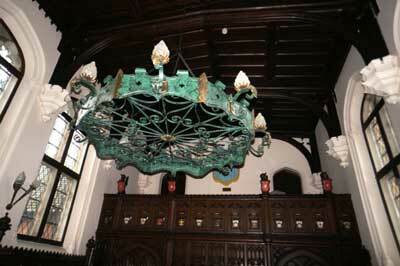 Hanging over the table is a large chandelier made by the late local craftsman Ray Jones some years ago. 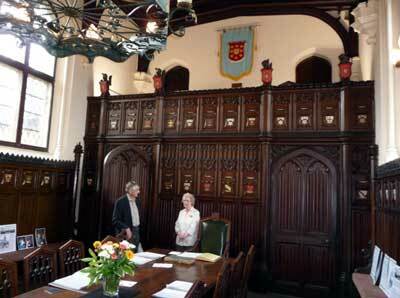 This room is named after a former Rector who, like Nicholas Chamberlaine, was to have a major impact on the town. To find out more his personal story, please visit the dedicated page on Henry Bellairs. The lounge is for the use of all residents and their visitors for social and recreational activities or simply as a place to meet and talk at any time. The Scheme Manager is responsible for the room and will give help and advice and should be consulted about booking the lounge and making use of it. The laundry is available to all residents. Lines for drying of washing are provided at the rear of the dwellings. No one other than a resident is permitted to live at the Almshouses. 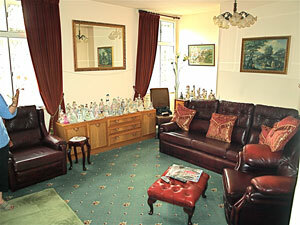 There is a guest room available for a relative or friend visiting for a short period (normally up to seven days). A charge is made for this service. Bed linen and towels are provided. A special concession is available under which residents pay only £7.50 each year for a television licence, providing they are retired, of pensionable age and under 75 years. It is possible for televisions to be connected to the Sky aerial system. The gardens have been laid out for the use and benefit of all residents. Most flats have individual plots to the rear, but if residents are unable to care for them, the work will be carried out by the gardeners by arrangement with the Scheme Manager. A prominent feature of the gardens is the Pump House. More detailed information about Services which are provided, Terms of Occupancy and general information can be found in the Almshouses Residents' Handbook which will be given to you when you become an occupant.